Classic cars captivate us with their beauty, rarity and engineering. 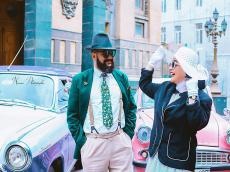 Ramesh Novruzov and Ulviya Abbasova bought retro cars, but also changed their lifestyle. The word retro contains the magical power of nostalgia for the good times. Retro is a return to the past in search of inspiration. This term refers to style, design and even art. Correctly matched retro clothes and accessories will tell others about the excellent taste and lifestyle. However, there are some unspoken rules that must be followed to make the image complete, and cause only enthusiastic responses from others. Strange for modern understanding, a large number of cute and seemingly senseless accessories - all this is like a breath of fresh air, a source of strength and energy for the birth of a new direction in modern life. This exquisite style is chosen by courageous people who are interested in the spirit of a bygone era, possessing a refined taste and the ability to embody it nowadays. A family couple can often be seen on the run of retro cars, they travel around the city, to work and various activities and even for a walk outside the city on Moskvich-407 (1961), GAZ-21 Volga 1965) and other classic cars, while they believe that their life seems to be the embodiment of the most cherished dream. "Most of women prefer modern cars, but not me. I like retro cars. but I like them. We go to work by retro cars and even travel to the regions," Abbasova told Trend Life. "Since our childhood there have been cars of different brands in our familises. My father was a taxi driver and he had GAZ-24 Volga, which was a real treasure for our family. Love for retro cars can not be compared to any feeling, it's something beyond the control of time and consciousness. We have four children and I hope we will move on to our love of classic cars. By the way, the older ones are already dreaming about the Seagull," said Novruzov. Fashion goes around in circles, and many things become vintage, that is, they experience the peak of their popularity once again. And someone just is a fan of retro clothes, clothes with age and history. To create a stylish and harmonious image you need to have a subtle sense of style and good taste. Retro fashion is one of the most relevant and popular styles. It captivates with elegance, charm fashionistas around the world. Iconic vintage styles for previous decades have paved the way for many designers who have taken inspirations from colors, cuts and design.